This past event featured a theme of “Rising Together”: A celebration of recovery in Sonoma County. Enjoy photos from our 2018 Airshow! Slideshow plays automatically, or swipe to seek through photos. The Wings of Blue is the padanrachuting unit at the United States Air Force Academy, near Colorado Springs, Colorado. Over the last several decades, the Wings of Blue has been one of the most outstanding parachute units in the United States. Since 1967, cadets have dominated national intercollegiate parachuting, winning 21 national championships. They have shown off their skills at the BCS National Championship, Orange Bowl, Copper Bowl, Fiesta Bowl, and Pro Bowl and at most Air Force Falcons football games. The team travels locally, nationally, and internationally to perform in air shows and competitions. Only 20 civilian air show appearances are approved each year, so Wings Over Wine Country is very fortunate to have them at our show this year. After flying with his friend Kay Eckhart, in one of Kay’s Lockheed T-33s in 2007, Greg set his sights on an upgrade to the U.S. Air Force’s first operational jet and a real piece of U.S. aviation history. Acquiring a T-33 and naming it Ace Maker in 2008. Then founding the nonprofit (501c-3) T-33 Heritage Foundation to help in the preservation of the type. He holds a Commercial Pilot certificate with instrument, single and multi engine ratings as well as being a Certified Flight Instructor. Type rated in Aero Vodochody’s L-29 Delfin, L-39 Albatros and the Lockheed T-33 Shooting Star. A level I Aerobatic low level card and FAST lead formation card round out his qualifications. The Hawker Sea Fury has been considered by many to be the King of propeller-driven fighters. It’s large size, abundant power and graceful lines add to its stunning appeal either on the ground or in the air. Now add the visual effects of dense smoke contrails following it through the skies and you have an idea of the incredible aerobatic display performed by Dennis Sanders as he puts the Sea Fury through its paces. Watch the effects of wing-tip vorticies and enjoy the sights and sounds of this of this powerful machine. Vicky Benzing is an accomplished pilot, skydiver, Reno racer, and prize-winning aerobatic competitor. She’ll be flying her 1940 Boeing Stearman, originally a trainer, then a crop duster, and now an aerobatic machine with a great big radial engine. Vicky will show you how very aerobatic this classic can be. The Red Stars are a group of pilots who fly the Cold War era Chinese CJ-6 trainer. They are the one of the only civilian groups approved for flying in close formation and wow, do they ever fly close! You’ll appreciate their precision as they fly wingtip-to-wingtip in their carefully choreographed routine. Scott has been with WSB Radio in Atlanta, GA since 1984 as a producer, show host, and helicopter traffic reporter. His background includes a career in all facets of media since 1970. He was won numerous news, programming and advertising awards. He is an Atlanta native. He took over host duties for Atlanta’s Morning News in January, 1991, with snow on the ground in Atlanta and war breaking out in the Persian Gulf. The show has grown in audience ever since and at times has been the number-one rated news-talk program in the nation. Donna has completed over 315 show and media days at over 35 sites in Canada and the United States. 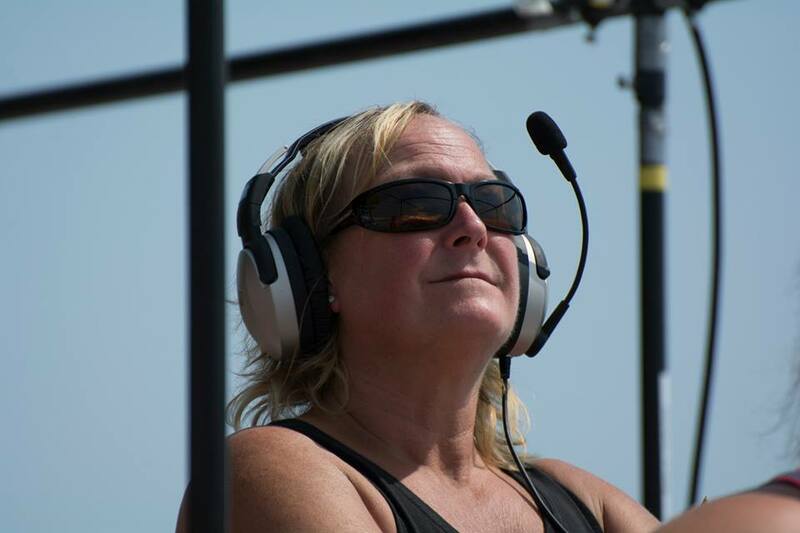 She has worked with all the North American jet and skydiving teams. Some of her show sites include the Catalina Air Show, San Francisco’s Fleet Week, Saskatoon’s famous Veteran event, The Canada Remembers Air Show, Niagara Falls, ON, Fort St. John, BC, Peace River, AB, Vandenburg AFB, CA and Klamath Falls, OR. The 2018 event featured a special “thank you” to those who came to the aid of their neighbors durning the wild fires. The Wall of Heros included restaurants who fed people, businesses who opened their doors, those who rescued animals, and shelters. Suggestions were made by Airshow guests and were featured at our event. The 2018 Wings Over Wine Country Airshow could not take place without all our generous sponsors! © 2016–2019 Wings Over Wine Country - All Rights Reserved - Design Optimization By OptiRev, LLC.